When picking a workout program, it is prudent to pick one that has a selection of upper body workouts that target the main muscle groups – the shoulders, chest, biceps, triceps and back. This makes it possible for you to build overall strength without muscular imbalances. Below are some of the great upper body workout routines you should include in your program. 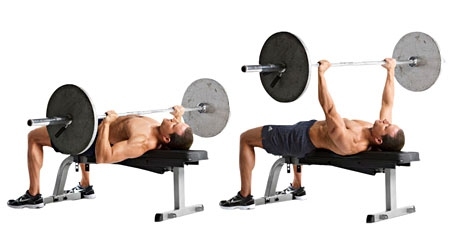 The bench press is a great workout for the large chest muscles, the shoulders and triceps. You can do a variation that targets the upper chest. While lying down on a bench, grab a barbell keeping your hands wider than your shoulders. Push the weight straight up while contracting the chest. Do not lock your elbows at the top. Bend your elbows and bring the weight down until your elbows are below the chest level. Do 3 sets of 8 to 16 reps. 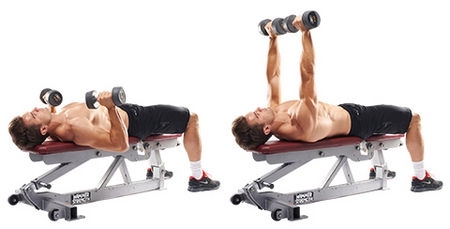 The dumbbell chest press is one of the best upper body exercises. Replacing a barbell with dumbbells for a chest press adds a different element to your chest workout. This is down to the fact that your arms have to work independently from one another. While lying down on a step or bench with a weight in each hand, stretch your hand straight up over your chest. You palms should be facing out. Keeping your elbows bent, bring down your arms until the elbows are just below the chest level. Lift the weights back up and bring them close to each other. Do not lock your elbows. Do 3 sets of 16 reps.
You can also target the chest by using a resistance band. The exercise will actually feel tougher, but you can always control the tension of the band by moving further or closer to its center. Fasten the band onto something stable and hold the handles with both hands so that they run along the inside of your arms. With your arms bent and palms facing down, begin the movement. Squeeze your chest and press your arms out while keeping the band stable. Avoid locking the elbows. This is a variation of the dumbbell chest press. It is quite challenging especially when done on an exercise ball. By alternating your arms, you are forced to engage your core to keep your body stable. Go lighter on the weights to avoid injury. Better yet, start off on a bench before using an exercise ball. Lie down on a bench or ball. Start off with a dumbbell in each hand raised straight up over your chest. Your palms should be facing out. Keep your left arm in place. Bend your right elbow and lower your arm until the elbow is just below your chest level. Without locking the elbow, press the arm back up. Repeat the move with the left arm. Repeat for 3 sets of 16 reps. This is a great upper body workout for women, which targets the upper back, shoulders, triceps, chest, abs and biceps. You will need a mat to do it. Assume the push up position with your feet lying slightly wider than your shoulders. While keeping your hips level, lift your left hand off the floor and bend your left elbow behind you so that your hand is next to your shoulder. Repeat the routine. This time you should rotate your torso so that your elbow is pointing up. Return to start. This is the end of rep 1. The pilates press is an upper body workout that targets the back, shoulders, triceps, biceps, abs and chest. Assume the push up position and make sure to keep both knees on the floor. Bend your right knee to 90 degrees with your toes pointing up. Bend your elbows towards your back while keeping your arms close to your body. Press back up. Do 2 sets of 8 to 10 reps making sure to switch legs for each rep. Lie on the floor in a plank position, balancing on your toes and forearms. Your elbows should be directly under your shoulders with your hands clasped together. Using your toes, move your body forward while bending the elbows so that your face is almost touching the floor. Move only an inch forward to make it easier. 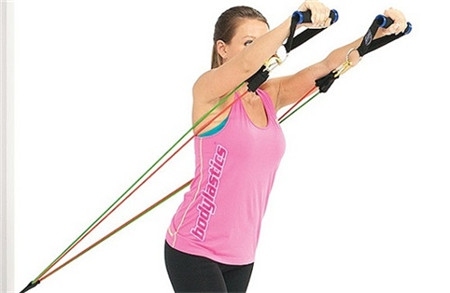 Use your shoulders to press backwards to get back to the starting position. Do not use your hips to do this. Do 2 sets of 8 -10 reps.
Start off by leaning forward at the waist and placing your right knee and right hand on a bench. Your left foot should be on the floor beside the bench. Grab a dumbbell with your left hand, allowing it to hang straight down with your arm fully extended. Pull the dumbbell towards your hip and pull your elbow in and far back as you can. Make sure to squeeze the shoulder blades together to ensure full contraction. 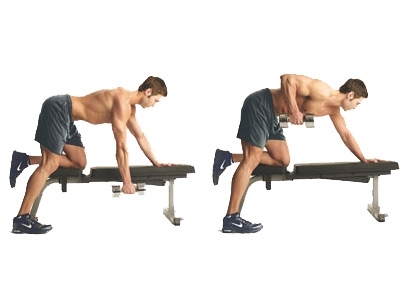 Lower the dumbbell to the starting position and do the next rep. Switch sides for the next set. Sit on the end of a bench and lean forward. Place your forearms on the bench to let them lie flat. Grasp a dumbbell in both hands with your palms facing up. Let the dumbbells roll on your fingers, then curl them back to the starting position using your fingers. Repeat for as long as you can. Server responsed at: 04/24/2019 6:22 p.m.